As we concluded the first installment of this series, we left the Tuileries on the eve of the French Revolution as a sleepy building abandoned by the royal family for decades. The King and Court still resided at Versailles during the spring and summer of 1789, when Louis XVI summoned the Estates General, an elected Assembly of representatives of the Nation, to deal with the budget crisis. Paris had been briefly considered as the seat of the Estates General, but it was soon decided that they needed to meet close to the King and his ministers, in the Palace of Versailles. Things were not going smoothly in the spring and summer of 1789, and many began talking of a “Revolution.” Bread was lacking, the King has massed foreign mercenaries around the capital. The people of Paris were restless and the Bastille, the hated symbol of the absolute monarchy, was stormed on July 14, 1789. The summer saw another dismal harvest, and Parisians were starving. On October 5, a crowd of women from Paris set forth for Versailles to ask the King and the National Assembly (the new name the Estates General had given themselves) fro bread. I describe these events in my first novel, Mistress of the Revolution, and they are also related in many memoirs of the time, in particular those of Madame Royale, daughter of Louis XVI and Marie-Antoinette. The King received a delegation of the Parisian women and succeeded in pacifying them. One of them, either from the emotion of seeing him or from malnourishment, fainted. A group of men from Paris, followed by Lafayette’s National Guards, joined the women, and together they set camp in the gardens of Versailles. All seemed quiet when in the early hours of the 6th of October one of the Queen’s Bodyguards fired a shot at a man in the gardens. That was interpreted as a provocation from Marie-Antoinette and immediately triggered a riot. The women rushed inside the Palace to “make lace out of her guts.” In her chemise and petticoat, she barely managed to escape to the King’s Bedchamber. I will not relate here the details of that momentous day, but soon the crowd demanded that the royal family move to Paris. In a few hours Louis XVI had lost control of the situation and had to comply. The National Assembly declared that it would follow him forthwith. All of a sudden Versailles had ceased to be the center of power in France, and it would never recover that status. In the following days, however, the other tenants were summarily invited to leave, furniture was brought in from Versailles, new apartments were set up for the royal family, including a King’s Bedchamber, and a part of the park of the Tuileries was enclosed to create a garden for the Queen and her children, separate from the area open to the public. There Louis XVI and Marie-Antoinette were surrounded by a small Court of faithful followers, a pale shadow of the spendors of Versailles. Her closest friend, Madame de Polignac, had already fled France. Now the Queen, deprived of the pleasures and privacy of her beloved Trianon, occupied her days with politics, needlework and knitting, and a daily game of billiards after dinner. The King and Queen never forgot the circumstances of their arrival in their new palace, nor the dangers of its location in the heart of Paris. They were now at the mercy of any riot, protected by National Guards whose loyalty to the monarchy they very much doubted. The National Assembly, right after the King’s arrival at the Tuileries, had moved to the Salle du Manège, the former indoors riding arena built during the childhood of Louis XV next to the palace. The government was now firmly resettled in Paris. From then on, the history of the Tuileries becomes tightly bound to that of France and the French Revolution. It was from there that the King and Queen set forth on their disastrous flight to Varennes. 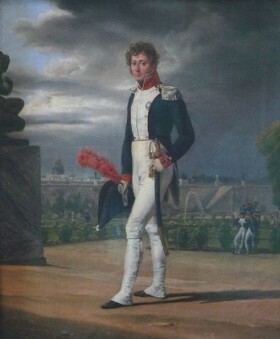 One of the causes of the fateful delay in the departure was that Marie-Antoinette, unfamiliar with the surroundings of the palace even after an eighteen month stay there, lost her way in the neighboring streets before joining the rest of the royal family in the carriage driven by Fersen. It is also to the Tuileries that the royal family was taken back after the failure of the escape plan. From then on they were closely watched to prevent any other flight and became effectively prisoners in their own palace. Finally it is the Tuileries that witnessed the fall of the monarchy after the storming of the Palace on the 10th of August 1792. On that day the royal family fled the Palace before the attack, which had been anticipated for a few days, and sought refuge with the Assembly in the Salle du Manège. The Palace was not defensible militarily, and the King made the mistake of waiting until the afternoon to order the Swiss Guards who defended the Palace to surrender. It was too late: over a thousand had died on that day, both Swiss Guards and insurgents. The Tuileries were ransacked, Louis XVI and his family were taken prisoners and transferred to the tower of the Temple. The legislative body elected after the abolition of the monarchy, the National Convention, disdained the Salle du Manège and settled within the Palace to mark the transfer of power from the King to the representatives. Soon the Committee of Public Salvation, led by Robespierre, that ruled the country until 1794 held its sessions in the former apartment of the late Princesse de Lamballe.